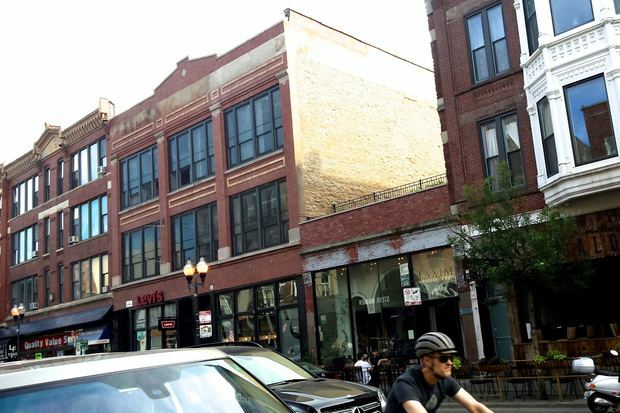 WICKER PARK — The chef of an acclaimed Greek restaurant has brought a distilled liquor to patrons called raki, a drink introduction that coincides with the launch of a serene rooftop patio at Taxim. The patio is called "To Hayati," pronounced tow-ha-YA-tee, which means "The Rooftop," Taxim Chef David Schneider said. 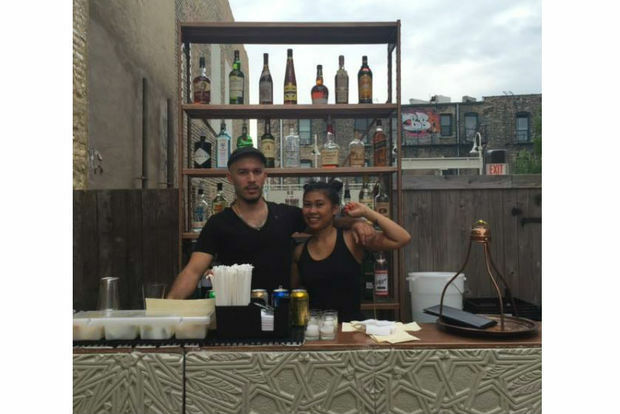 To Hayati at Taxim is located atop the restaurant's one-story building at 1558 N. Milwaukee Ave., and celebrated a soft opening on Saturday during Wicker Park Fest. Schneider said Monday that finishing design touches are still being added. But if all goes well, the rooftop — which seats 80 and houses an extensive herb and vegetable garden using seeds brought back from Greece — will be fully open by Aug. 5. Modeled after rakadika — spots in Greece where people go to imbibe in the hard liquor and enjoy small, shareable plates — the rooftop patio is set back. The first rooftop patio on Milwaukee Avenue between North Avenue and Division Street, the approval process took several years and required a zoning change and a special use permit from the city. Served in a karafaki (carafe) offering four shots or in a single shot (sfinaki), raki, considered to be a potent cousin to absinthe, is usually sipped but it can be consumed quickly, too. "I'm very thrilled to share this element of Greek hospitality with Chicago," said Schneider, who opened his restaurant in 2009. 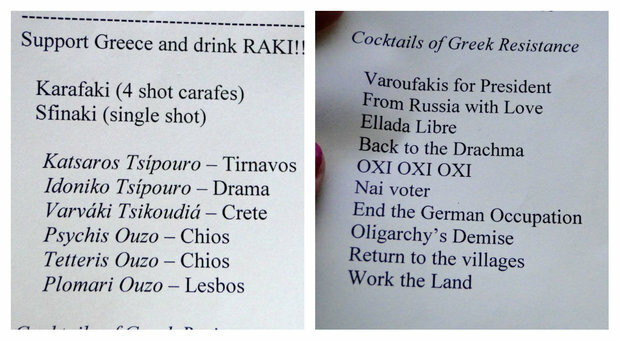 In addition to raki, which Schneider imports from Greece, a new "Cocktails of Greek Resistance" 10-drink list inspired by history is served on Taxim's rooftop. The first cocktail, "Varoufakis for President" refers to Yanis Varoufakis, whom Schneider described as "one of the most honest and trusting leaders in Greece," an academic and former finance minister that "should be president." A New Yorker piece describes Varoufakis as a "rockstar economist. " "Varoufakis for President" mixes bourbon and lime juice with vissino, a homemade sour cherry syrup made from cherries that Schneider and his staff picked from a northern Illinois farm on a recent road trip. Sour cherries are a popular treat in Greece and the syrup is used to top ice cream, Schneider said. The drink represents "the hot Greek Summer" in weather and politics and the fact Varoufakis is "full of energy and and has energized Greeks." Another drink, "End the German Occupation" refers to World War II, when the Russians, British and Americans joined forces but it was the Cretan resistance fighters, with no weapons or plan, who took on invading Nazi paratroopers with a vengeance. According to reports, "men and women, the very young and the very old, attacked the invaders with axes, scythes, and butchers’ knives," with an old man even using his walking stick to club a paratrooper to death. To commemorate the guerilla warfare on Greece's largest island, "End the German Occupation" is Taxim's version of a Long Island Iced tea using sweet liqueur made with a wild herb, diktamon, sourced from the mountains of Crete to represent the Cretans, as well as Stoli Vodka for Russians, Bombay Gin for the Brits and Bacardi Silver repping American soldier's role in the resistance. In addition to raki and cocktails, there are also about 12 Greek wines — rose, white, red and sparkling. The Hayati's garden features several tomato varieties, okra, mustard, lettuces, and various indigenous herbs, all picked frequently and used in Taxim's dishes. Next summer, the plan is to have "a Greek charhouse" on the rooftop so Schneider can grill entire pigs, goats and lambs. For now, the menu consists of salad plates and charcoal grilled wood skewers offering pork shoulder, kalamari, yogurt marinated chicken thigh and summer squash. Side dishes include grilled pita, olive and pickle plates, feta cheese and grilled halloumi, a Cypriot goat's milk cheese. Desserts such as Greek yogurt with local honey and house made seasonal ice creams with orchid root, mint and sour cherries round out the Hayati's menu. Taxim, 1558 N. Milwaukee Ave. Hours are 5:30-10 p.m. Monday-Thursday; 5:30-11 p.m. Friday-Saturday and 5-9:30 p.m. Sunday. Reservations encouraged. Ph: 773-252-1558.